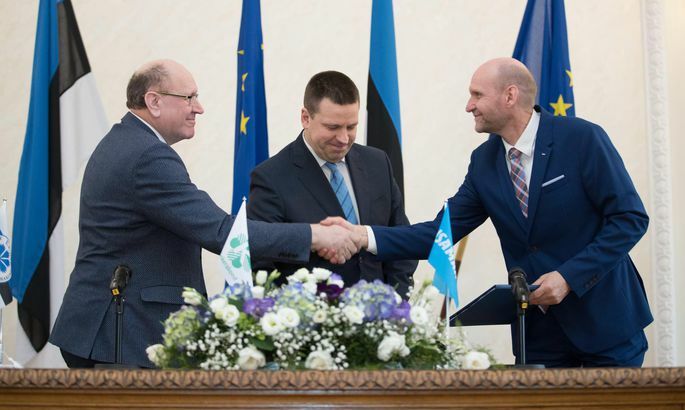 Chairman of Estonia's Center Party Juri Ratas, chairman of the Estonian Conservative People's Party (EKRE) Mart Helme and chairman of Isamaa Helir Valdor Seeder signed a coalition agreement. Ratas said that he wishes to thank EKRE and Isamaa on the Center Party's behalf for the substantial negotiations and consultations conducted. "These three weeks have shown that the three parties wish to cooperate and are willing to compromise," he said. The incumbent Estonian prime minister said that the keywords in the coalition agreement are a coherent society and search for cooperation, and, among other objectives, also fostering the return of the Estonians currently residing abroad. "Estonia will undoubtedly remain on the current course in terms of foreign and defense policy," Ratas said, adding that the rule of law is also to continue in Estonia. The chairman of EKRE, Mart Helme, thanked Ratas and said the latter has led the coalition negotiations in a flexible yet consistent manner. "The negotiations were on several occasions on the verge of breaking down, but thanks to Ratas, it did not happen," Helme said. Helme added that the chairman of Isamaa, Helir Valdor Seeder, too, had an important role in the conclusion of the coalition agreement. "We are satisfied with the agreement and despite our opponents' criticism it is an ambitious agreement, not one marking stagnation. Estonia has not had an agreement like this one for a while. Cast aside your prejudices, my friends, read the agreement and ponder the long-term objectives set in the agreement," Helme said. Seeder, too, thanked his partners for the constructive negotiations. "If one were to characterize this agreement, one would say it provides balance between different political views," he said. "No coalition lasts forever, but we are hoping that the one to being established will last for four years," Seeder said, adding that Isamaa will do all in its power to make sure the coalition stands until the next general elections.